The exhibition has been prepared with even more attention than usual paid to our audience. Especially FOR YOU we present works of art that both complement and develop our Collection of the 20th and 21st century Art in a particular way. Thanks to the works the collection can participate in creating contemporary reality to an even greater degree by presenting the current examples of international creative works. All works were purchased last year as a part of the National Collections of Contemporary Art programme of the Ministry of Culture and National Heritage. The title address FOR YOU is for us the reversal of the title of one of the works presented at the exhibition. 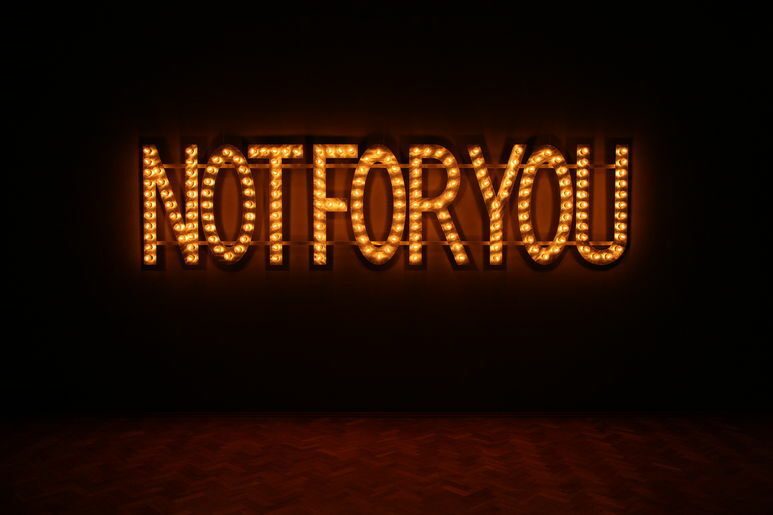 Monica Bonvicini in her light installation titled Not for You emphasises the power of unequivocal yet ambiguous refusal. Going against that assertive character and owing to its visual attractiveness the work catches the eye and attracts attention, thus becoming a sign of encouragement. The refusal included in the content is reversed in the splendour of the form. We want to draw our visitors into an even more intense game of reversals with the help of the other works presented at the exhibition. It complements and develops our permanent exhibition in which the Collection of the 20th and 21st century Art is presented in four parts referring to the key experiences of contemporary people. We describe these experiences with the use of such notions as body, trauma, prosthesis and utopia, construction, politicization or eye, image, reality as well as object, fetish, phantasm. Now we add to the collection of Muzeum Sztuki works that confront the experiences characterised by three words: clashes, reversals, hopes. Clashes — define art’s involvement in the most important tensions and conflicts born out of dramatic economic, social, and political transformations of the recent times. Reversals — define strategies of contemporary artists who attempt to realise art politics with the use of its defenceless yet not fruitless means. Hopes — define the objective of artistic involvement, combining creativity with an attempt to induce a change for the better. The FOR YOU exhibition is an invitation to participate in art’s clashes bringing hopes, positive changes brought about by more or less radical reversals. The latter are crucial as the refer to perversity which makes art so intriguing.